This lovely cake is the perfect combination of flavors and textures. 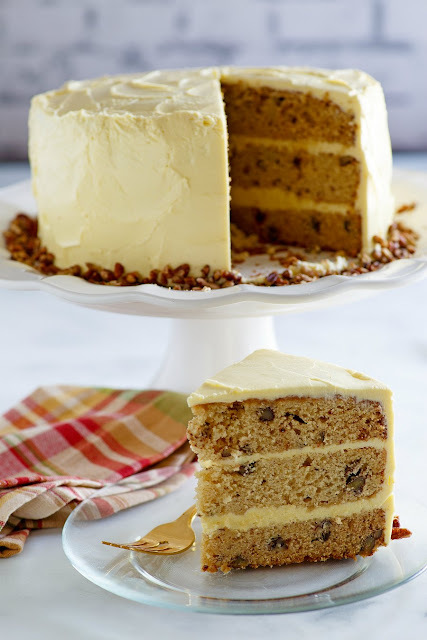 The warm maple syrup blends perfectly with pecans for an out of this world cake, the maple frosting is amazing too! Dessert is served and it's delicious! 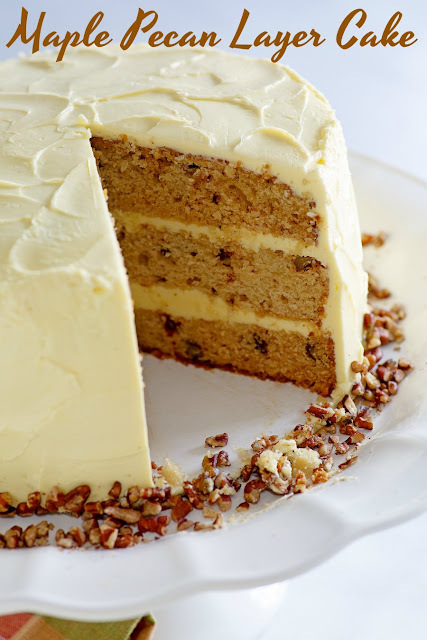 Layer upon layer of maple cake studded with delicious pecans and wrapped in maple frosting. It is a dream come true in cake form. Make it for birthdays, coffee with your friends or Thanksgiving. Now matter the reason, just do yourself a favor and make one for dessert as soon as possible! I made this cake for my uncle's birthday a couple of years ago and it was a smash hit with my family. So I thought it was high time to update the pictures and share it with you again. It would be a great addition to your holiday dessert table. Hip, hip, hooray!! It is finally time to reveal the new Cake Slice Bakers book!! If you don't know, I am a part of a really fun group that picks a new cake themed cook book each year and bakes from it for a monthly post. Anabel, our fearless leader picks 4 cakes each month and we all bake one of the 4. We keep it a secret until we reveal it on our blogs on the 20th. Each fall the group picks a new book and we reveal what the new book is in our November post along with our first bake from the group. Slowly but surely, the whole group started getting excited about one book over the course of the last year. By the time fall came when we would have normally voted, most of us already had the book and were saving it just in case it was chosen. As each member purchased it, they would be amazed by the beautiful pictures and couldn't help but to share the excitement with the group. That would inevitably encourage somebody else to by it and the cycle continued until most of us had it. So this year, we didn't vote. It seemed like this book was destined to be it. So without further ado, I will introduce you to our new book. It is World Class Cakes, 250 Classic Recipes from Boston Cream Pie to Madeleines and Macarons by Roger Pizey. Ta da! And let me tell you, if you are a person that loves to thumb through a cookbook and be awed by the photography, this is a book for you. If you are a cake lover, this one is for you too! We have only done one bake from it, and I am not sure what the other bakers made... but I do know that most everyone is in love with what they made and we are all really excited to bake more cakes from the book! My Uncle Steve turned 60 last month and I was really excited to have such a great occasion to bake a cake! So I looked at the cakes in the list for the month in an effort to pick something that would work as a good extra special birthday cake. 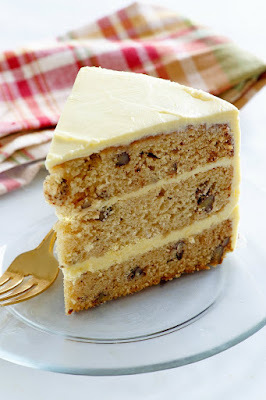 The second I saw the Maple Pecan Cake, I knew that was the one. It was perfect for my uncle and definitely befitting of a milestone birthday. I did do a little bit of adjusting to the recipe. It called for two eight inch cake pans. I thought I had some, but it turns out I just have an ever growing collection of nine inch pans. The recipe says it only served six anyway, and that would never do with my large family of sweet-teeth. So I made more or less one and a half times the cake batter and put it in three nine inch pans. Then I doubled the frosting, because I think we all know by now that the frosting is my favorite part. The results were amazing, if I do say so. My Uncle Steve said it was absolutely perfect with a great texture and great flavor. It doesn't get any better than that from the birthday boy! Preheat the oven to 350 F and grease and flour three 9" cake pans. In a medium bowl, whisk together the flour, sugar, brown sugar, baking soda and salt until there are no lumps and it's completely mixed. In another bowl, mix together the wet ingredients. Combine the wet and dry ingredients together until just mixed. Fold in the toasted pecans. Assemble using a double batch of maple buttercream. Refrigerate and serve chilled. That cake was gorgeous! Let me tell you how funny it was to hear the sounds people made as they enjoyed their first bite. It was that good. I'm anxious to check out what your friends made and look forward to what else you all bake up from this book in the coming months. I'm excited to see theirs too. It was fun to hear people as they tried the cake. It really was a winner! That does sound so good. I wish I'd made that one too! They all looked so good this month! I want one of each! Happy Birthday to Uncle Steve! Glad he enjoyed his cake, and even happier it was made with love! A little extra love does go a long way! Thanks, Anabel! This sounds delicious and you frosted it beautifully! I have to make this for the work crowd. They deserve a real cake that isn't a test recipe. Have a good Thanksgiving, Carlee. Thank you, Linda! I am sure they will love it if you make it. Have a super Thanksgiving! Wow, Carlee, you make the best desserts. This month definitely had some real winners, I hope that is the case all through the book. I already want to go back and bake some of the other cakes! Thank you! A picture perfect cake! Glad that your uncle appreciated your efforts. Very impressed with your upscaling it so well. Yay for this book...a winner. Thank you! A little more cake is almost always a good thing ;-) I am really enjoying this book so far! That's a beautiful cake! I can see why the birthday boy is so happy with it! Looks beautiful and delicious! Thank you so much! He was definitely pleased and it ranked right up there among my favorites too! Hi Carlee, a nicely understated looking cake that I wouldn't say no either. I'm glad your Uncle enjoyed it. It was really delicious, Debbie! Thank you! Thank you! It was really delicious! Carlee, your uncle Steve had to be exceptionally pleased with that cake. It's definitely a winner in my book! It's gorgeous as well as delicious. The new Cake Slicers book looks incredible, I love thumbing through cookbooks that have fantastic photos. This looks like it would be right up my alley I can't wait to see what you cook up next. Or should I say I can't wait to see what you bake up next! Thanks, Nikki! The cake really was delicious and the book it comes from is beautiful. I can't wait to bake more! Your cake is so neat and tidy Carlee, it was a great choice wasn't it?! Thank you, Laura! I was really pleased with it and can't wait to see what this book brings over the year! Love the energy you put into your post, and an excellent cake choice for an important event! Looks amazing! Ha, thank you! It really a winner! This cake sounds so good. I really wanted to bake it, but couldn't justify the expense of maple syrup here. I will have to wait until I go to the States next and pick up some to bring back. I'm with you on the frosting. A little extra never hurt. Right? It is hard to imagine things that are so readily available here aren't so easy to get elsewhere. It is definitely worth getting some syrup for it next time you are stateside! This cake has me drooling! Thanks for linkin' up with What's Cookin' Wednesday! It is definitely drool worthy. Thank you, Karly! Dang girl! I need to put this cookbook on my wishlist! It is a beauty, that is for sure. Thanks! Carlee, the cake is gorgeous! I love the look of a three-layer cake, but I don't really like frosting. No matter how good a frosting is, I only want a bite of it, rather like candy. And a lovely French buttercream is very rich. I make a maple pecan cake and pie and tart and cookie and other things because, well, isn't that just a wonderful combination! Thank you, I will gladly eat the extra frosting form your piece! Thank you! It was so good, Jessica! Worth making next time you need a special cake, for sure! Thanks! It was killer, Hazel! I am definitely making it again! Maple is one of my very favorite flavors. I have to try this! Mine too, it's so warm and cozy. I hope you love it! The cake looks fabulous! The book sounds interesting too! Such a beautiful cake and what a treat for your Uncle! Thank you, it was really good if I do say so myself! Uncle Steve is a lucky fellow ...LOL! That cake looks very tasty! We sure enjoyed featuring your awesome post and thanks so much for sharing it with us at Full Plate Thursday! Hope you had a great thanksgiving and hope to see you again soon! That's a really beautiful cake Carlee! I'm now doing cake slice bakers just to force myself to make cake. They are not my strong suit! What a beautiful cake! I'm a big fan of maple anything too, and it looks and sounds delicious. Gorgeous! And I bet the maple tasted fantastic. 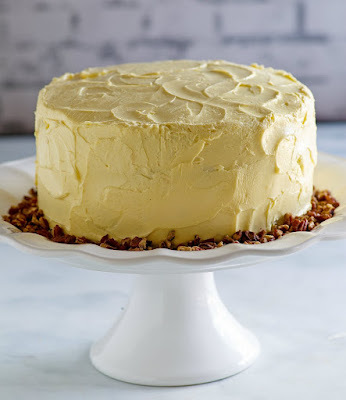 Any cake with pecans has definitely got my interest...I'm a sucker for them, especially at this time of year! This is a really beautiful cake with awesome flavors! What a beautiful cake. 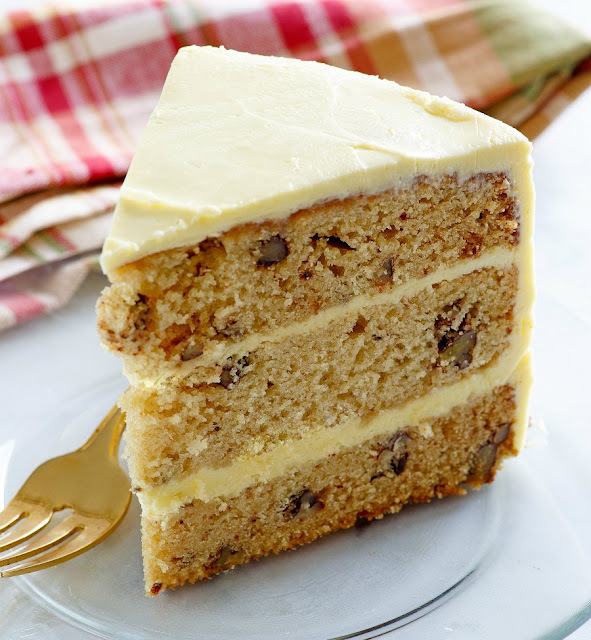 This is a cake that I'd absolutely love, with the little bit of crunch from the pecans and that sweet frosting. Would be a great alternative to a Thanksgiving pecan pie too! I will jump at any excuse to use maple syrup! This looks absolutely delicious! That is one beautiful looking cake! I'm sure it tastes delicious too!